His quote sometimes gets mangled, and people remember it as “Music hath charms to soothe a savage beast.” Either way I think we can all agree with him. Music is a wonderful, marvelous, divine, magical thing that can have the deepest effects upon all savages. In this clip we see and hear the soothing, healing effects of music. Blood-hungry feral monsters become completely calm after listening to the mellifluous song of a Zen master. Rocks soften, knotted oaks bend, and the savage breasts become so civilized you could even let them eat dinner at your table. If you know anything about Wayne Newton at all, you probably think of a mainstream American singer who made his career mostly in Las Vegas, a big man with a big personality and a complicated personal and business life. But there’s another side to him. He was a sort of child prodigy, performing in public from a very early age. In fact Newton was a supremely talented young man—a singer of great charm and elegance, with a perfect sense of rhythm and a magnetic yet discreet presence on stage. It’s worth your while to watch this clip of a 26-year-old Wayne Newton singing one of his trademark songs, “Danke Schoen,” in 1968. From head to toe, Newton is energized and directed. His head and neck are poised, and his shoulders relaxed. His legs and feet move only a little bit—but, oh, how intelligently, how creatively! The song gets bigger and more exciting moment by moment, but Newton doesn’t lose his cool at all. Instead he just “opens up his energy field,” so to speak. His sense of rhythm and phrasing is supremely sophisticated, every note and inflection sparkling with joie de vivre. And his voice is the very sound of happiness. If you’re a singer, instrumentalist, conductor, dancer, or actor . . . watch and learn! Recently I’ve been writing about what I call the Oppositional Principle for musicians—the idea that you may be able to play, sing, or conduct better if you keep your body relatively still, moving little beyond the needed gestures of your technique. The still body can condense and distribute energy more powerfully than the moving body. It all depends on how you do it, of course! 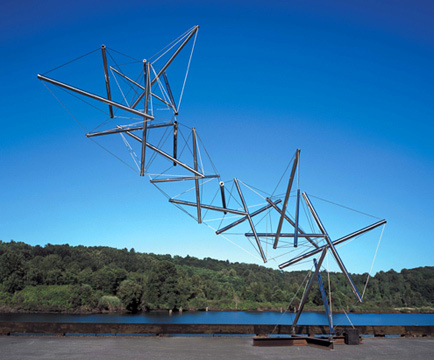 Your stillness ought to be the result of many tensions brought to balance, like a Kenneth Snelson sculpture in which multiple forces in multiple dimensions all contribute to the overall stability of the structure. If you organize your forces in this way, then music will “charge you up.” The fluid energies of music will oppose your stable forces, and music itself will come through condensed and powerful. After you visit Snelson’s beautiful website, come back here and watch Samer Totah, a great oud player who focuses his movements where they can carry the greatest power. What I’ve been calling the oppositional principle in music is a way of singing, playing, or conducting in which the musician moves relatively little beyond the composition’s (or improvisation’s) immediate technical needs. Like all concepts, this can be easily misunderstood. I don’t think it’s good for you to be inert, passive, rigid, stiff, boring, afraid, or self-conscious! Instead I advocate a steady presence, like a bouncer at a nightclub who stands so confidently by the door that no one even tries to sneak past him. Call it “latent power” if you will. You can achieve it by distributing your physical tensions throughout the whole body from head to toe; firming up your spine, all the way from the skull to the coccyx; and pointing some of your energies toward the floor (as if anchoring yourself) and some toward the ceiling (as if unmooring your inner Zeppelin). In other words, you “think up and down” at the same time. You can give extraordinary, extravagant, intense, intoxicating performances in this way: the body doesn’t move, but the music soars! Watch the violinist Ivry Gitlis playing Camille Saint-Saëns’s “Introduction and Rondo Capriccioso” without losing his anchored feet and legs, without throwing his head about, and without huffing and puffing. It’s the music that goes crazy, as well it should! What I've been calling the oppositional principle in music is a way of singing, playing, or conducting in which the perforer moves relatively little, instead letting the music move through him or her and on to the public. In recent posts we saw Louis Armstrong, Charlie Parker, Dizzie Gillespie, and an entire choir of male singers perform while keeping themselves quite still on stage. Today I'd like you to watch two different pianists demonstrating the approach: a very young Ahmad Jahmal and a not-so-young Mieczyslaw Horszowski (who was still playing the piano after his hundredth birthday). Jamal and Horszowski move their bodies only a bit here and there. They produce magically sweet sounds at the piano. And every one of the notes they play has a clarity of intention that make the notes "speak" as if coming directly out of the piano. These two great artists show that the oppositional principle knows no boundaries: you can embody it if you're white or black, young or old, a cool cat or maestro. What's also interesting is that by embracing an universal principle you'll remain a unique individual; Jahmal and Horszowski are completely different from each other, even though they're very similar! I'll go on a limb here and state that only by embracing universal and timeless principles can you really fulfill your individual mission on this planet. The assumption that to make music you must move your body a lot is widely shared, by audiences and musicians alike. Some people think that the only way for a musician to express himself or herself fully is by “moving with the music," and it’s true that there are many great instrumentalists, singers, and conductors who take a balletic, athletic approach to music. But there have always been master musicians who, instead of moving with the music, let music “move through them” and on to the audience. In fact, by remaining relatively still musicians actually condense and heighten the power of music to move the audience. What I call the oppositional principle in music—where the musician opposes the movement of music through the stillness of his or her body—applies to all fields of music-making. You might suppose that jazz musicians usually move an awful lot when they play. After all, those guys improvise crazy stuff and lead wild personal lives, right? Counterintuitive as it may seem, the jazz greats move almost not at all when they perform. Check this clip with Charlie Parker and Dizzy Gillespie—two of the greatest players ever—and watch how little they move. An interesting detail is that when Dizzy lifts and drops his trumpet, he does it at a very slow tempo, much slower than the tempo of the music. Moral of the story: If you stand still, the craziness just gets deeper, broader—and better. Bodily coordination comes in many forms, one of which I believe is particularly rewarding for musicians. It consists in suffusing your body with latent mobility—that is, the capacity to move in a thousand different ways, held permanently in reserve—but without actually moving much beyond the minimal movements you need in instrumental and vocal technique. Depending on how you do it, holding your body still may have the effect of condensing and multiplying the energies of music itself. Your rhythmic drive and the richness of your sounds will actually be bigger if you don’t move a lot. Imagine a canister full of gas. If you heat the canister, the gas inside will expand and push against the canister’s inner walls with ever-increasing power. Canned and heated gas, in other words, has more power than gas that isn’t canned or heated. Let’s call this compressed energy. The compressed energy of the expanding gas can be put to a constructive use, for instance to propel a rocket. A few weeks ago I offered Louis Armstrong as an example of condensed energy when he plays the trumpet, though not when he sings. Here I offer you the Sardinian folk group Coro de Iddanoa Monteleone. The conductor moves a bit, the singers move almost not at all… and music itself moves with unstoppable power!